JoJo's Lite Brite Emporium: EXCITE BRITE! 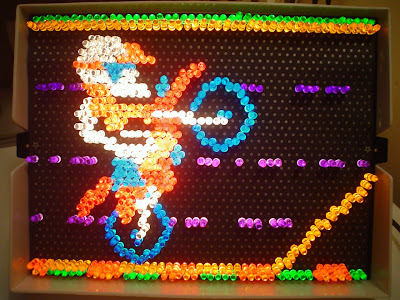 An Excite Bike Lite Brite! I really had to get creative with colors on this one, due to a limited amount of pegs, and all but it turned out really great, methinks. And remember, be sure to leave me a comment with your thoughts! Dude that is wicked amazing. I love it. This is the best Lite Brite themed blog on the internet!